Theme : Groundwater and Life. Of the 368 oral papers in the program 25 were on managed aquifer recharge (17 in 4 sessions devoted to the MAR theme and 8 in other relevant themes. This must make a new record for the highest rate of contributions on MAR to an IAH Congress. In addition there were a number of other closely related papers, notably in aquifer thermal energy storage and a keynote address on injection induced seismicity. Sincere thanks to the organisers for their attention to detail through the conference and in the organization of the scientific program and its documentation. This report aims to present the most novel and important material heard by one person in a conference with 8 parallel sessions. Apologies if your brilliant paper was missed. A number of papers described the formation of MAR projects in Afghanistan, Chad and Vietnam. It was encouraging to hear in each case the disciplined approach to aquifer characterization, water quality evaluations, consideration of a range of methods accounting for local conditions, and plans for monitoring and socioeconomic analysis. Andrew Ross presented the outcome of first stage of the work of the IAH-MAR Working Group on Economics of MAR, on the capital, operating and levelised costs of MAR operations. Increasing from 21 sites (in his SWARM paper) to 28 sites through additional site data made a sizable difference to levelised costs of water recharged under 4 categories – natural and recycled waters for each of infiltration systems and wells. Hence more sites are needed, to gain confidence in the use of the figures as representative. Andrew also needs information on costs of alternatives to MAR and benefits of MAR to be able to produce cost-benefit analyses. Prof Kyoochul Ha, conference organizer, described development of six MAR technologies in Korea: Jeju-friendly stormwater diversion from ephemeral streams, reservoir storage, sand filtration and recharge wells; water curtain cultivation system – spraying g/w on inside of plastic glasshouses for warming, collection and reinjection; convergeant MAR –pumping water from Nakdong River to a reservoir and for injection in wells around pumping wells (ASTR); mine dewatering for direct water supply coupled with recharge upgradient of wells in a bedrock aquifer; six groundwater dams to basement each supplying >20,000m3/d for agricultural use since the 1980s; thirty riverbank filtration schemes operating successfully since established up to 30 years ago. Peter Dillon presented on behalf of the IAH-MAR Working Group on 60 year history of MAR development. Reported MAR amounted to 10 km3 /year in 2015, about 1% of global groundwater use. The rate of increase in MAR is 5% /year the same percentage as the rate of increase in groundwater use, so MAR is not keeping up with groundwater use and global groundwater depletion rate was 145km3 /year. MAR is a very small 0.06% of the average annual recharge of 12,000km3/year. However where MAR is practiced it is locally very significant and can sustain resources. This work, together with a summary of advances in MAR research and governance, has been published on-line in Hydrogeology Journal, along with 16 national histories in more detail, and photos and descriptions of a number of sites, and is open access thanks to UNESCO at https://doi.org/10.1007/s10040-018-1841-z. Simon Higginson and Thomas Bothwell reported on the development and expansion of the Perth Groundwater Replenishment scheme. Attention to detail in investigations and research, consultation with stakeholders, a three year trial, proof of concept, operational matters, and risk management saw the scheme implemented at 14 Mm3/yr in 2017 and growth to 28 Mm3/yr in 2019. The scheme uses treated municipal wastewater and provides ultrafiltration, reverse osmosis and ultraviolet disinfection before injection into deep confined siliceous aquifers from which, after a number of years travel time, it will be recovered by water supply wells given the existing groundwater treatment and distributed for drinking water supply. Thomas described the process adopted from oil and gas drilling to prepare for and construct 22 deep wells each capable of being developed to 20,000m3/d. This targeted reducing non-productive time by avoiding reeming and overworking, reducing hole diameter, quick connection rods, casing selection (GRE), innovation in drilling fluids and well development, 200 sensors near the bit and over the rig for control of bit position and drilling fluid, pressure, weight and torque, and having a single source of realtime information shared instantaneously by the driller, supervisor and client. This is planned to reduce drilling time from 250 days to 28 days and so far is on track. Xueyen Ye and students of Jilin University presented three papers on clogging in sand column experiments that further explores their work on blocking (surficial) clogging and internal (deep bed) clogging for a range of silt and sand sizes, silt concentration, and velocity. Yalin Song explored impact of ionic strength and surface roughness on colloid clogging and found that particle mobilization at the start of the study reduced permeability to 13% initial value, and that both ionic strength and particle roughness increased colloid retention. Ruijuan Cui evaluated effects of ionic strength and nutrient concentration on biological clogging in columns with growth of pseudomonas auruginosa. Clogging occurred at the column inlet, and increased with nutrient solution. Sodium ions neutralized repulsion by negatively charged sand and bacteria. 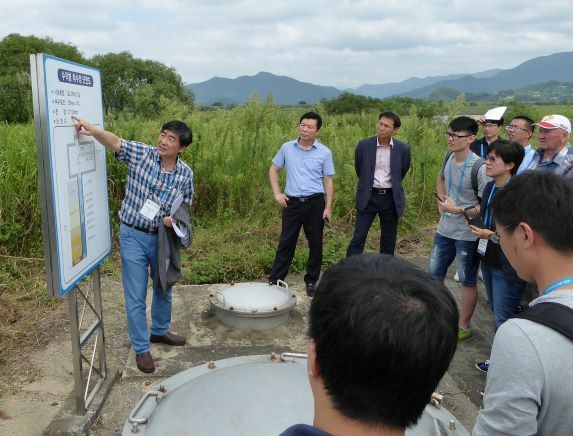 A field trip visited the Daesian Clean Water Centre, Korea’s first riverbank filtration water plant, built near Changwon adjacent Nakdong River following investigations in 1997. Prof H. Kim who did these investigations and established the project was on hand to explain. The plant started operation in 2001 at 10,000m3/d, now operates at 60,000m3/d and this is being extended to double production. There are 36 vertical wells and one radial well spread over a 5km length of riverbank. Extracted water is aerated in towers and the oxidized Fe and Mn are removed by rapid sand filtration and granular activated carbon filtration. An infiltration basin recharges backwash water from filters. Monitoring wells and used to check for pesticides and nutrients from nearby agricultural land. A paper by Xiaosi Su described studies of redox zonation in a riverbank filtration site on Liao River in NE China, and reported two flow paths to RBF wells with Fe, Mn and N in g/w exceeding drinking water guidelines, and hence requiring treatment. Similarly, a paper by Quang Khai Ha reported mobilization of As, Fe and Mn in a saline confined aquifer in response to rainfall injection in Vietnam, and he suggested removal of DO and NO3 before injection to overcome the problem. Kryzysztof Dragon studied the attenuation of pesticides between Warta River and a network of riverbank filtration wells in Poland. He found negligible attenuation to horizontal collector wells below the stream bed, greatly reduced concentrations in vertical wells at a distance of 60-80m and very low concentrations at wells 250 to 680m from the river. He recommended RBF wells have a minimum distance of 100 to 200m at this site. Dan Liu of Jilin Uni measured formation and removal of the disinfection byproduct, chloroform, in columns and found a half life of 29 days at a DO concentration of 1.4 to 2.9 mg/L. Ralf Junghams of TU Dresden gave an update of cloud-based modflow modelling and optimization of placement of ASR wells using a genetic algorithm. Shemin Ge, Univ of Colorado, Boulder gave a keynote talk on fluid injection induced seismicity in USA, associated with deep reinjection of brines from oil wells in Oklahoma, Texas and Kansas. Her study showed background earthquakes were steady at 10-25/year from 1970 to 2015. However earthquakes within 15km of deep well injection during periods of injection increased slowly after 1995 then dramatically after 2005, reaching 650 quakes in 2015. Increasing pore pressure reduces effective intergranular stress hence reducing resistance to shear stresses on faults and fractures to the point of instability and the possibility of earthquakes. Increasing oil production above 105 barrels/month increased the proportion of injection-associated earthquakes from 50% to 90%. Average depth of injection wells was 2-4km. Interestingly, the incipient injection pressure associated with earthquakes was only 0.07 Mpa (ie 70 kPa corresponding to 7m water pressure, only 0.35% of the pore pressure at 2km depth. Modflow modelling suggests increases in pore pressure can extend 40km from such injection wells. This information warrants consideration by any thinking of performing ASR in deep hard rock aquifers. Nico Goldscheider’s keynote paper on global challenges and local solutions in karst hydrogeology revealed a 35% decline in glacier melt water between now and 2050 as a result of climate change. The ice pack that is now a seasonal storage cannot be relied on in the future to defer flows until warmer months. Niels Hartog and a number of other speakers on aquifer thermal energy systems (ATES), focused on measuring and predicting recovery efficiency for heat storage, which is normally somewhat lower than recoverability of water with respect to solutes. Niels referred to a worldwide map of potential for ATES, which not surprisingly increased in potential where seasonal temperature changes are largest. David Broutt gave a keynote talk (Birdsall-Dreiss lecture) entitled “do you know where your catchment ends?” He referred to a dimensionless parameter that indicated the watertable was topographically controlled under wet conditions, and controlled by recharge under dry conditions. The parameter partitioned USA broadly into a topographically controlled east and a recharge controlled west. This suggests baseflow in streams in the east, which means that MAR in unconfined aquifers would need to be remote from such streams if the objective is to retain the stored water locally. Yanxin Wang referred to studies on the North China Plain and data at one location revealed an increase in arsenic from 110 to 1100 ppb corresponding with an increase in groundwater levels. This is a warning for those contemplating recharge into depleted aquifers that contain even trace amounts of arsenic minerals. James Sorensen presented a paper on real time fluorescence for the improved monitoring of e-coli in drinking water. E-coli cells emit an amino acid that includes tryptophan that fluoresces and tryptophan-like fluorescence (TLF) can be quantified in field fluorometers (costing ~US$10,000) with a detection level corresponding to 10 cfu/100mL. It has now been applied in source waters for 4 public water supplies, and correlation coefficient between E-coli numbers and TLF was 0.73 compared with 0.4 between E-coli numbers and turbidity. Research is planned to reduce costs and lower detection levels. If you found this report helpful, please advise at the next plenary With more reporters more sessions could be covered.